L is for Lettuce Spinning. I have a clean white pillow case I use for spinning lettuce. Yep. I guess that’s right up there with dishwasher fish. But it works! When I buy lettuce I break it into bite sized pieces and wash it a sink full of cold water. Then I dump it into the pillow case, close it tightly with a twisty-tie, and place it in the washing machine on the spin cycle. The extra water spins out of the lettuce so it’s clean and crispy. It can be used right away, or stored in an airtight container where it will stay fresh for really long time. We wanted to let them be part of these things, but we hated the idea of just bankrolling so many activities. So we came up with the idea of having them earn dollars by memorizing scripture. We thought of it as a “bank account” of scripture they would always have in their hearts. When I was in first grade at Saint Thomas Moore Catholic School, I participated in some kind of scripture memory contest. I committed John 3:16 to memory long before I even had a clear idea of what the bible was all about. And I’ve never forgotten it. So I knew that there would be benefit in making my own kids learn verses to pay for their church activities. We gave them a dollar of camp credit for every verse they memorized. They each had a little notebook where they recorded the scriptures and the dates of the event where the spent the dollars. They memorized literally hundreds of scriptures, some of which, I trust, are hidden in their hearts to this very day. N – Napkin on the Lap. I think we first heard this idea on Focus on the Family, but like most of the ideas we picked up, we tweaked it to make it our own. There was a penalty for anyone who forgot to place a napkin on his lap. That unmannerly individual had to go outside and count aloud to ten. This applied to all meals at all places. I can still see David, with totally fake chagrin, walking slowly through our favorite Chinese restaurant. He went outside to the window beside our booth and began counting slowly and emphatically in Spanish, grinning at us through the glass. At every meal, as we finished saying grace, the kids’ eyes would dart around the table, looking to see if there was anyone they could catch with an un-napkinned lap. And always, when a visitor came for dinner, they fell all over themselves explaining the napkin rule. It’s been awhile since I visited our idea basket. I you’re new to Paladini Potpie, you can click these links to read parts, one, two, and three, which cover Alphabet Games to Knitting. Categories: Idea Basket | Permalink. I – In-boxes for mail. Those plastic organizers that attach to the wall – you can get them at office supply stores or Wal Mart. We each had an in-box with our name on it. They were mounted on the wall by the phone and it saved on piles of mail and magazines on the tables and counters. J – JOY – Sometimes the kids thought this was cool and other times they thought it was hokey. But we told them a perfect acronym for JOY: Jesus first. Others second, Yourself last. JOY. K – I was talking to Monica and John about our best Paladini idea that begins with “K”. Monica said “knitting”. She reminded me that I taught all of them to knit when they were very young and David even knitted a scarf to give Amanda when they were dating. John said his favourite “K idea” is kissing on bridges. (It has become a tradition over the years that we kiss every time we walk across a bridge.) A tradition is not exactly the same as an idea, though. And this particular post is about ideas. But I do think kissing traditions are good ideas… And I think it’s a good idea to pass knitting (or whatever crafting skills you have) on to your Kids at an early age. Last week I talked about our little friend, Justus, who had a “big ‘deea”… Now after some discussion I realize that the little guy with the big ideas was not Justus, but his brother Jazz. Ooops! Just goes to show how important it is to write stuff down! abcd…E – Easter Candy. I mentioned this idea in my Easter Traditions post. We didn’t do Easter baskets, but instead I gave the kids a few dollars and took them to the grocery store the day after Easter. They could choose their favourite kind of candy and get much more for their money. Notes left on the counter were often not noticed. Notes left on the fridge were lost in the welter of pictures, magnets and cartoons… and so I was thrilled to find this little magnetic memo board at Wal Mart or somewhere. 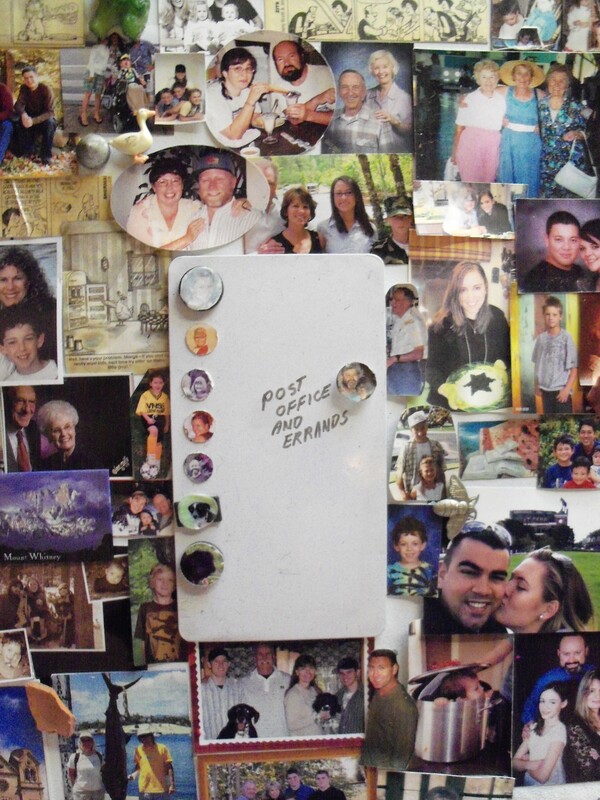 I cleared a place on the front of the fridge to mount the memo board and cut out circle head pictures of each family member…pet…and friends who wanted to be in on it. We glued the pictures to round magnets and had a perfect place to always look for messages to one another. G – Glasses. Everyone had their own special glass (in their favourite colour) to drink from throughout the day. A line of glasses on the window sill above the sink was much better than a dozen dirty glasses in the sink or on the counter. H – Handicap in Scrabble. I grew up playing Scrabble, and love it. So I wanted to instill Scrabble Love into my kids the minute they were able to spell three letter words. Rather than give them hints or show them places to play when they were very young, we gave them a handicap. They started the game with 100 points. (Later it dropped to 50 points as they got better at spelling) And the strategy worked. Even though the kids are all grown up and gone, the air waves are alive every day with on-line Paladini Scrabble games and Words with Friends. In recent years it’s become a catch phrase in our house. Every time someone says, “I have an idea! ” Someone else replies, “Hey dies, I dot big deea!” and we smile, thinking about, Justus, my friend Geigy’s young son. Ice cream! Sounds like a good idea to me! When my kids were little they were also full of “big deeas”. Sometimes, like Justus, the big idea was something like having ice cream, but more often they were far more elaborate. Little people with big ideas… I love it! If it was an idea we couldn’t do at the moment (or ever! 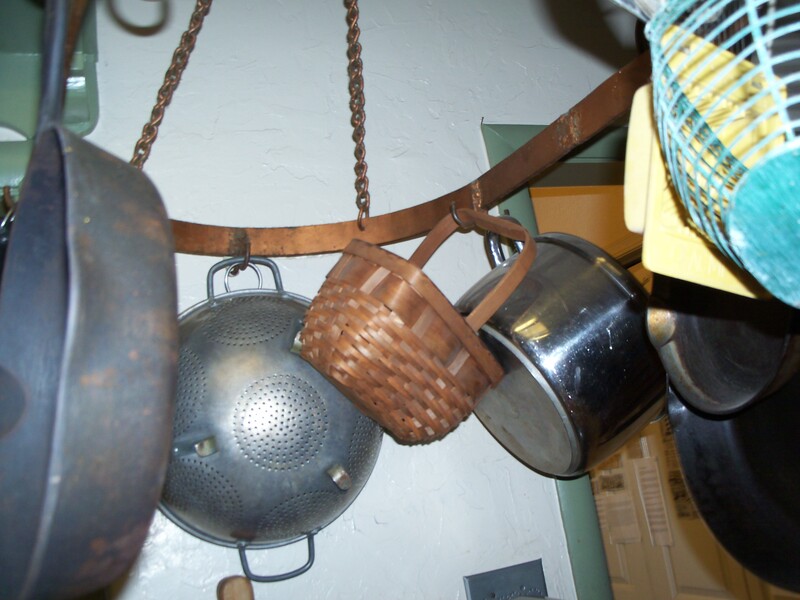 ), I told them to write it down and put it in the idea basket we hung on the pots-and-pans rack in the kitchen. Some of their ideas were “dig a swimming pool in the back yard” or “make a fish pond with a waterfall”. Sometimes the idea came with a sketch or dimensions scrawled in childish pencil. The ideas piled up in the basket, and from time to time we dumped them onto the table and had fun reading them and talking about them. We got some good ideas…but we never did dig that swimming pool. Today as I write this post I came up with “a big deea” of dumping our basket into this blog. I hope you enjoy them! A – Alphabetical list games: We made up alphabetical games of every kind when we were on long road trips. The alphabetical animal game…alphabetical fruit game…alphabetical famous person game. We would go around taking turns thinking of an animal or fruit that began with the next letter of the alphabet: aardvark, bear, cayote…apple, banana, coconut,…Ansel Adams, Buffalo Bill, Chuckie Cheese. B – Binder clips. We use these to hold the folded end of the toothpaste tube after we push the toothpaste up toward the top. C – Christmas cards prayers. When Christmas cards come in the mail I don’t open them right away. We wait till dinner when we are all together and then we take turns opening them. Whoever opens the card says a prayer for the family or person who sent it to us.